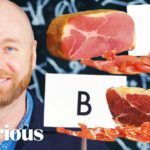 Epicurious challenged meat expert Elias Cairo of Olympia Provisions to guess which one of two deli meats was more expensive. Cairo breaks down cuts of salami, ham, bologna, mortadella, hot dogs, sausages, and prosciutto. For each round of deli meats, Cairo visually scans, smells, and taste tests each meat before guessing which deli meat costs more. Once the prices were revealed, Cairo explains why a specific deli meat costs more and dives into specifics on what to look for in a deli meat.